Mike Slater (left) hands over the Outstanding Volunteer Award to Keith Warmington during a Warwickshire Branch Commitee Meeting in 2015. 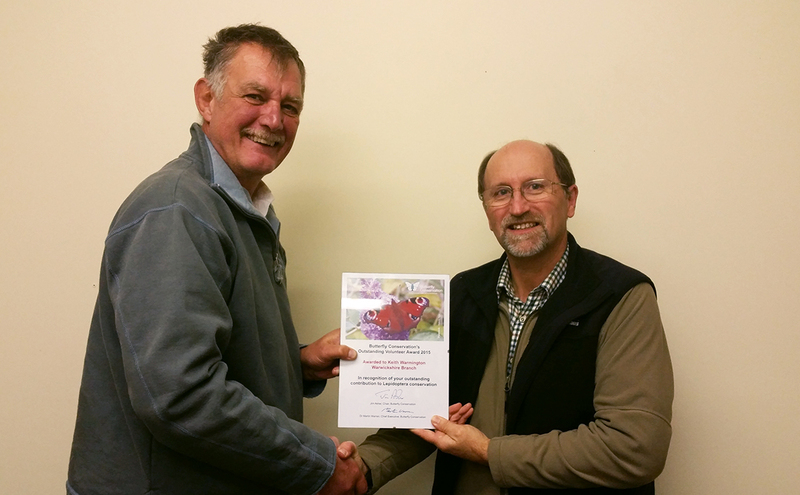 Keith Warmington awarded Outstanding Volunteer Award by Butterfly Conservation. Keith Warmington has made significant contributions to Butterfly Conservation in Warwickshire undertaking various roles for the branch including Chairman, Treasurer and Branch Butterfly Recorder. In 2003 Keith co-wrote ‘Butterflies of Warwickshire – Their Habitats and Where to Find Them’. 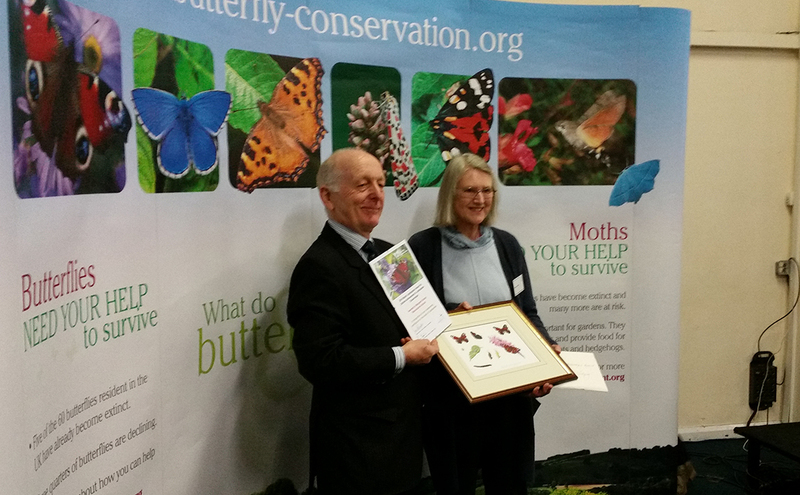 Peter Titley presents the award to Margaret Vickery at Butterfly Conservation's National AGM held in Stoneleigh, Warwickshire - November 2014. Margaret Vickery awarded Outstanding Volunteer Award by Butterfly Conservation. Margaret Vickery received the Outstanding Volunteer Award from Butterfly Conservation at the National AGM in 2009 held at Winchester. Margaret’s contribution towards the conservation of butterflies has been huge at a national, regional and local level. Nationally she has served on the Conservation Committee, single-handedly run the Garden Butterfly Survey since 1990, written books and articles on ‘Gardening for Butterflies’, ‘Butterfly Plants for the Garden’ and ‘Butterflies as Indicators of Climate Change’ to name a few. Regionally she became a founder member of the West Midlands Branch in 1979 and served on the committee in roles such as Newsletter Editor and Branch Liaison Officer. Locally Margaret has worked as volunteer warden at Harbury Spoilbank (fighting a battle with encroaching Hawthorn and Rose scrub for many years armed only with a pair of loppers!). 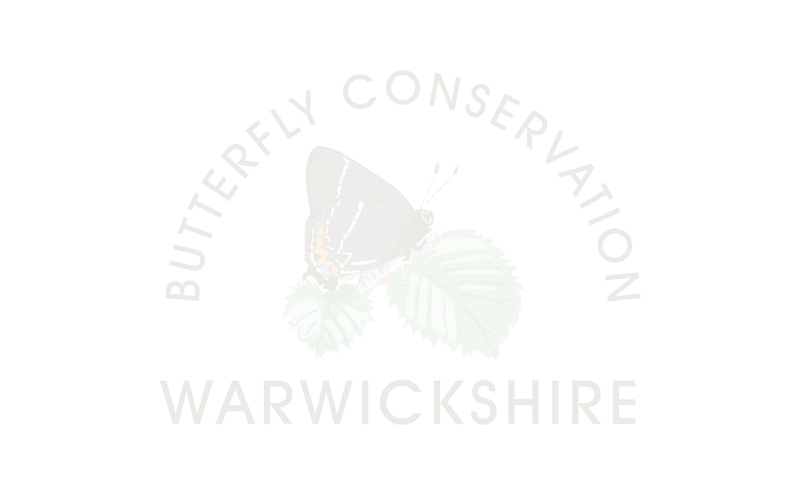 She starting the first Warwickshire Butterfly Transect on the site in 1988 and her experience in establishing the West Midlands Branch made her the driving force behind the formation of Warwickshire Branch in 1997 where she served as Organiser and Chair for over 10 years. 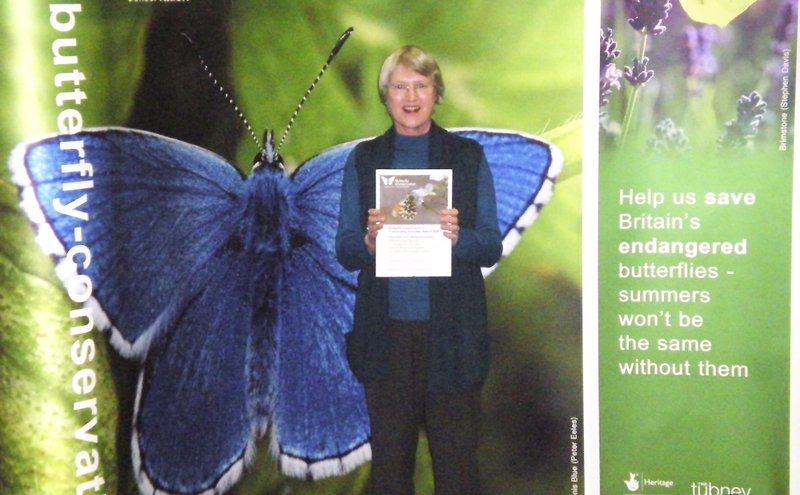 In recognition of her contribution to our Branch, Margaret was made President in 2008 and it is fitting that Butterfly Conservation recognised her outstanding contribution in 2009. Phil Parr awarded Outstanding Volunteer Award by Butterfly Conservation. Phil Parr received recognition for his 50 years of being involved in conserving butterflies moths and their habitats. He has surveyed every part of the Rugby District in detail and on many occasions has been the only person that has driven the conservation work in this area. Throughout the 50 years Phil has given up most of his weekends during the winter months to undertake the vital habitat management himself and has been responsible for saving colonies of Grizzled Skipper, Dingy Skipper and Green Hairstreak and the last remaining Warwickshire site for the Forester Moth. 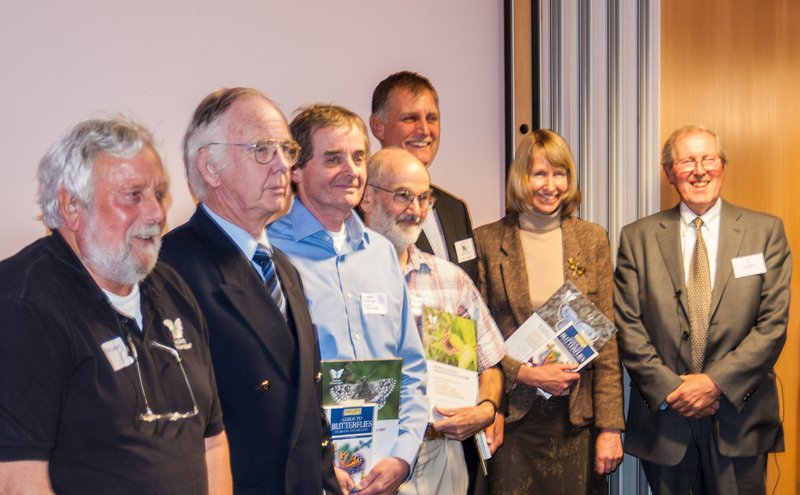 Mike Slater (third from the right) awarded the Outstanding Volunteer Award by Butterfly Conservation at the Butterfly Conservation National AGM in 2007. Mike Slater awarded Outstanding Volunteer Award by Butterfly Conservation. Mike Slater was awarded an Outstanding Volunteer Award during Butterfly Conservation's National AGM in recognition of his substantial contribution to the conservation of butterflies in Warwickshire, especially Ryton Wood Meadows Reserve which was offically opened in 2007.